Congrats to Alan Fakry for the winning entry and 50 duck prize. Thanks to everyone who entered and voted! Here are the final results of the Caption this drawing caption contest. "I am Playception! Evil brother of Drawception!" Paintception tosses its nemesis's weapon into sea. Peelzebub has a pencil put aside for me! And so Pictionary swore: Drawception would pay! Pencilception has been banished... for now. Paintception has come to rule this webpage. There can be only one... HighDrawer! Evil P and his sidecick, Mr. Pencil. Thus, P had to avenge his fallen brethren. Crap!! Who drew an ocean on my panel??!! That devilish Paintception stole the pencil! P, the D's heroic nemesis. P picking perfect pencils posing powerfully. Could this be? Drawception's alter-ego? One day, it will be my turn to overthrow D-God. Drawception's evil twin, Lord Pingas. Horned P plans to fulfill destiny with pencil. If Evil D is a P, then that means...Pornception? 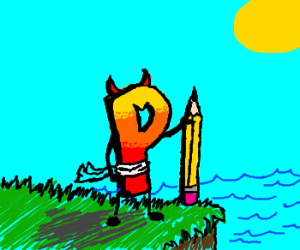 "P" on his conquest to overthrow "D"
Evil P for Pencil. Dominating the world. drawdevil prepering to redraw this land to evil! Satan possesed the letter "P"
Which one of you is the evil twin? Crap! He drew a sea on my panel?? !